As you already know, the warmer weather over the last few months spurred my recent desire to eat ALL THE VEGETABLES. Did you want some produce for yourself? Sorry, it’s all in my refrigerator crisper drawer. When I re-evaluated my life as Someone Who Eats Vegetables, All of Them, I realized that the Asian-inspired dishes in our regular meal rotation were solely lacking in the vegetable department. As in, they were often meat, sauce, and rice or noodles. At best I’d throw in a frozen bag of steamable mixed veggies, but even then, it was to “stretch” the dish so we would eat less meat and therefore save a few dolla dolla bills. And that’s a dang shame, because Asian dishes need lots of veggies! I know this, because the tactless Chinese guy in the lab next door likes to tell us that we all eat too much meat and not enough vegetables. He also tells us that our desserts are too sweet and American high schoolers can’t do math. I am not stereotyping, I am quoting him. But for the vegetables. He’s got a point! 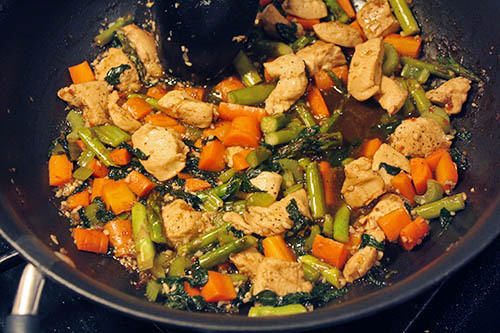 So inspired by this dish (featured on the MyPlate Pinterest board), I stocked up for my next Asian dinner. Spinach, carrots, celery, and asparagus! 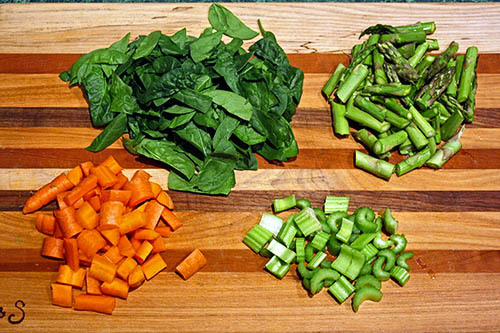 Just a few stalks of asparagus and celery, two carrots, and a big handful of spinach will do. Chopping vegetables is really one of my favorite kitchen activities. I’m not very good at it, but that just means more time to enjoy the activity! Once I’d chopped up the veggies, then I diced up the chicken. Even if I’m cooking the veggies, I always chop them before I dice the meat - don’t want to contaminate the veggies with the knife, board, or countertop! Then I tossed the chicken around in a few tablespoons of olive oil and sesame oil over medium heat for a few minutes, until it was partway done (still a bit pink in the middle, not that you can see that because you don’t have x-ray vision). While the meat was cooking, I assembled the sauce. It looks elaborate, but I promise, it’s not. Here’s the secret to keeping it simple: don’t measure. It’s mostly chicken broth (half a cup or so? ), soy sauce (uhh, a third of a cup, maybe?) and rice vinegar (a few tablespoons, -ish? 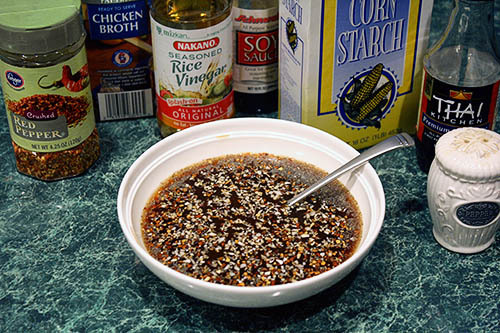 ), with red pepper, black pepper, cornstarch mixed with water (a tablespoon of each should do), dried minced onion, a few drops of fish sauce. Oh, and lots of minced garlic. The dish has to earn its name somehow! Don’t bother with precision; unless you have a very discerning palette, it’ll taste the same anyway. And if you have a discerning palette, you gave up reading this blog loonnnnnnng ago. Now. 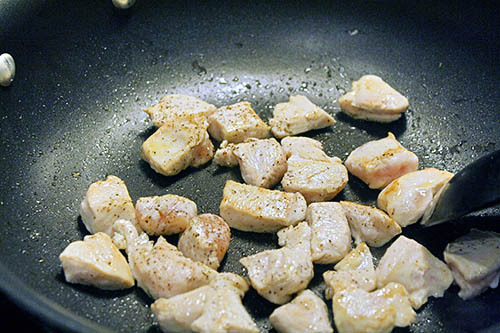 Listen up, because this part is important: we are not making an authentic stir-fry. The original recipe was actually a casserole (yeesh), so I adapted it. But if anything, I adapted it into a... stew. A stew without a ton of liquid. But does it taste reasonably like restaurant-quality Chinese food here in the States, minus the fat and MSG? Yes! So ignore whatever tactless comments your Chinese co-workers might have about this not being a stir-fry and pour that sauce right in over the meat. Then throw in the carrots, celery, and asparagus, too. Turn up the heat just until the liquid simmers, then turn the heat down to medium and stir it around for a few minutes. Your goals here (because it’s good to have goals!) 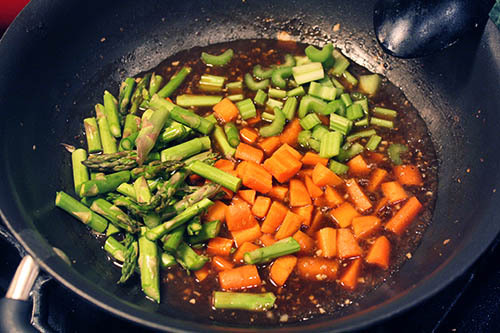 are to reduce and thicken the liquid, finish cooking the chicken, and get those veggies to turn a nice bright color. Once you’ve met your goals (high five! ), add in the spinach. Because ALL THE VEGETABLES! 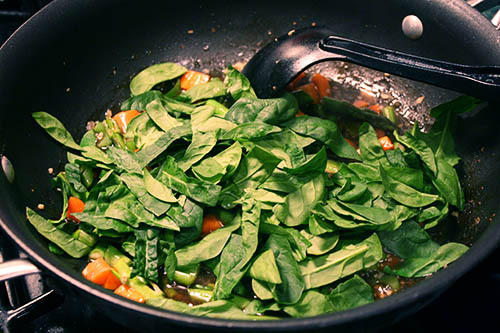 Stir it around until the spinach wilts, and then you’re done! I was done too, apparently, because I totally forgot to take a photo of the finished dish. (Still not a real food blogger! Never will be!) So you’ll just have to imagine that we ate this over rice, and that it was dark so my lighting and white-balancing was awful. Shouldn’t be hard to imagine. The verdict? Well, I’mma be honest, Mr. P said he liked it the other way better... the other way, I suppose, is “lots of meat with frozen veggies”. Too bad, dude, your dinner options have reduced to being pumped full of fresh vegetables or PBJs! As I was craving MOAR VEGGIES RAWR, I thought this was delicious. And the low calorie count for the portion size was a bonus! I’d like to make this again and swap the chicken with other veggies (jalapeños and bell pepper, mmmm), just to reduce the calorie count further and increase the likelihood of PBJs for Mr. P’s dinner. The only other tweak would be to use less (or no) chicken broth... the end result was a little watery. Of course, I could have removed the chicken and veggies (so as not to overcook them) and simmered the sauce longer, but I was too hungry for veggies to have that sort of patience. If springtime is causing you to crave veggies, this dish is a delicious way to load up on them! I hereby give you permission to borrow ALL THE VEGETABLES from my crisper drawer.